Expert advice to spark the interests of a variety of skill levels with special attention paid to exploring cables, lace, color, and texture. Twenty-five contemporary designer hat patterns that range from the distinctly feminine to the sporty gentlemen, including cloches, berets, beanies, tams, snoods, and more! Tips and tricks on how to maximize the use of specialty yarns and accessories to add a little panache to your designs. All the designs in Weekend Hats are ideal projects for travel, gifts, or sneaking in between larger knit projects. 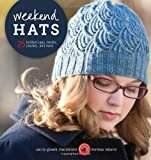 Whether you’re interested in comfort, style, or just knitting enjoyment, Weekend Hats is your all-in-one resource for creating want-to-wear knitted caps.